I have a fun little project in store for you all. I have a 300mm x 38mm x 3mm bar of san mai I will be sending out for heat treat sometime early next year. 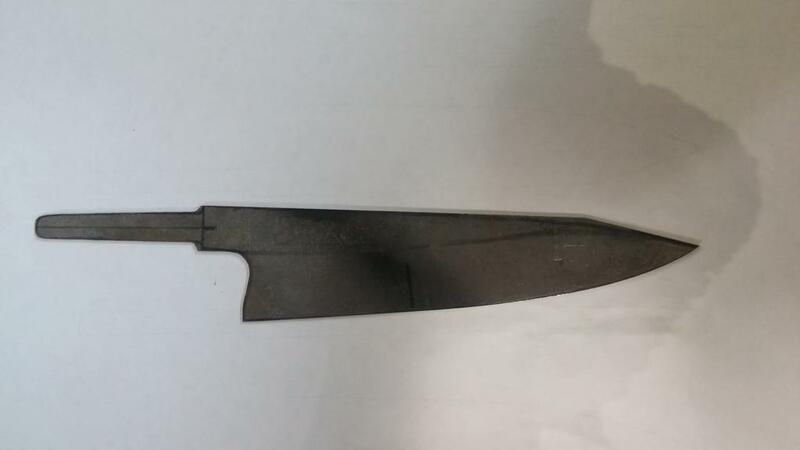 Once get through my current orders I will include this blade in my next batch to Peters heat treat. I wont name the steel until after the pass around. It will be a mystery All I will say is that it is a premium product only recently available outside of Japan. If any members here wish to contribute to the design please feel free to post here or email your thoughts. You can also sign up for the pass around here and I will copy and paste once the official pass around thread is created. The design parameters is pretty open ended. 3. Grind can be a 48" radius double bevel "s" type, convexed, or full flat grind. Due to the san mai it must be 50/50 though. 4. This could have a huge flat spot or very little. 5. The distance between front of handle and the choil is also a critical dimension for many. 6. Handle shape can be Octagon, D, western, oval, or even dove-wa if enough people want to see this in person. I will keep the type of steel and RC hardness a mystery so that we can really get some objective analysis going. 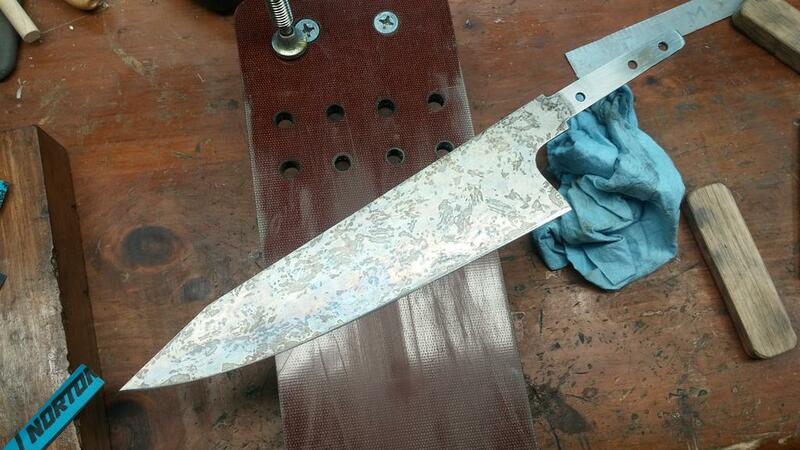 I will also post a photo of each step as a guide and idea as to what goes into my method of producing such a knife. I am carrying this thread over from the old forum. We settled on TWO different designs. This sounds like a great idea. I think most people are too concerned about steel type. Often, confirmation bias dictates opinion on performance. I will be interested in following this closely. I love the profile on the petty and will be in the market for one soon. The petty looks great Tim! One note though, we in the J-knife world know mm better than inches now, SO CONVERT! Liking the look of the KTip Tim. Although I personally would like to see it flatter. 38 mm high at the heel!! I Will have to measure the K-tip when it gets back from heat treat. I dont remember the dimensions and my cad template somehow got saved over with a longer more narrow design....hmm! First thing I will do when I get it back is check for straightness...clean the blade up and get a feel for the profile on the board. 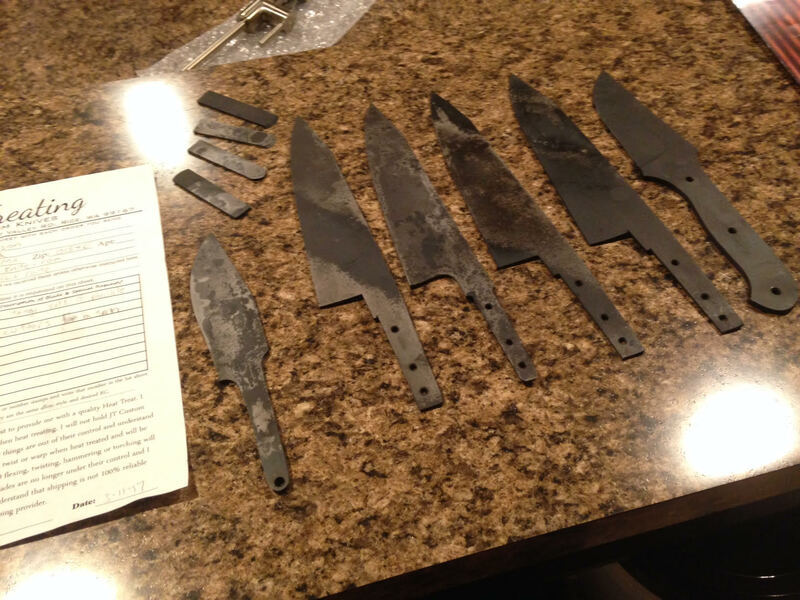 Then I will make slight changes to the profile before I decide what kind of grind it should have.....I am thinking of breaking in my new 4' radius platen to give slightly concave bevels and then use a low angle wide secondary bevel...force a crazy patina, maybe make it an Mirepoix demon. I envision chopping in confined space with this blade and a tip can dice onions with the best of em. In any case I will be able to pass around the K-Tip soon. If any one has a handle or want to make one to go with the blade to also pass around let me know! Looking good and sounding very promising Tim! I will be waiting for that passaround! What size handle do you think it needs? Meanwhile....please put me on the Pass Round list Tim. Getting my request in early! Please keep me in mind for the passaround. I'm excited for this blade. I just got word that the K-Tips are on the way back to me....I guess it was a bear to get those straight. Feel Free to go hard with this one at home or work...This is a line knife. Once I have the blade done I will be sending to Bensbites, he will be providing a handle for this one to also pass around. This blade is extreme thin, FFG to .005 and then hand sanded to a zero edge...so a very light convexing. Ghost tip all the way ..
Me too please, Tim. That ko bocho looks awesome by the way. Hey Tim. That Ko bocho looks extremely cool. Keep me in mind if you decide to do a passaround on that one too? Ive got a nice thin tip with a beefy heel. The distal taper is pretty much set and this time, I included distal taper along the edge too. I ground this blade for maximum versatility in a confined space. I am very interested to see how this steel performs in all the applications you guys may throw at it. OK, this blade is headed to Ben's to get one of his sweet handles installed. You folks can take a look at my current inventory and let me know what looks good. I am open to suggestions, but can't promise anything.